Hi! 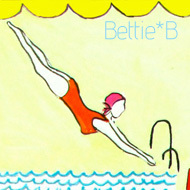 I'm Beth Saffer, (aka "Bettie*")... artist, designer, mother of two darling daughters and two senior dogs, and creator of Bettie*Blue. Surface design should make you happy, and that's why I've created colorful, fresh, playful designs - kind of a modern twist on mid-century Palm Springs bungalow style and bright swimming pool blues. Show off your fab sense of style with Bettie*Blue for ArtsCase. Custom colors always an option - simply contact me :) Enjoy!